Listen closely to the Trade Winds and you can hear the soothing sounds of the Hawaiian Islands and the fantastic tone of Diamond Head Tropical Satin Pastel Ukuleles. 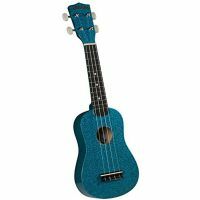 Soprano ukulele in bright, fun rainbow colors for everyone to enjoy. Strong maple body and neck in addition to a clear, high gloss finish make for long-lasting durability.